At this moment, you’re probably satisfied with how Windows 7 runs, but you probably want to squeeze as much juice as you can out of it. Despite the improvements, the operating system still takes up resources that didn’t necessarily have to be used for normal functions. Let’s have a look at a few of those you can turn off! 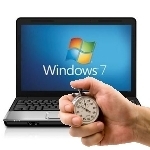 One of the most resource-hungry features of Windows 7 is search indexing, which creates a dictionary for your files, allowing you to perform faster searches. The problem is that, while it’s creating that dictionary, it consumes your hard drive’s read/write speeds significantly, making it difficult to navigate through applications while indexing is taking place. That’s why Microsoft included an option to turn this off. Click “OK” once finished. Once you reboot or stop the service manually, you won’t have to worry about your hard disk being eaten alive. If your computer gets kind of clunky while playing a movie or has difficulty emulating the graphics when you minimize or open a window, it’s probably time to sacrifice the pretty effects that Windows 7 Aero brings with it and just live with simple bland colors. The interface will function similarly to how Windows 7 Starter does. Removing Aero will give your computer a little more breathing room, especially if the display adapter uses some of the PC’s physical memory to perform. Remove Aero by right-clicking your desktop, clicking “Personalize,” scrolling down the list of themes that appear, and selecting “Windows Basic.” You’re done! maketecheasier.com maketecheasier, Microsoft Windows 7, Windows 7, windows 7 performance. permalink. Have Windows 7. Had to go about it a little different than the page says. But can get to it. Does this work for XP also? Couldn’t live without your newsletter!!!!!!!!!!!!!! lol, no. Indexing turned off will only affect the search speed for example on the start orb when you type in the name of a file, which not everyone uses, apart from that, turning indexing off improves performance everywhere else because it frees up so much usage. who cares if it takes slightly longer to search for a file because most people dont use that function anyway we know where we store our files. Get a good supply of your favourite beverage before you turn indexing off… you're going to have plenty of time to drink it.